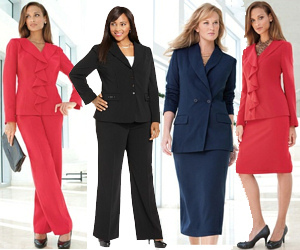 Women's Plus Size Business Suits are available in a good range of sizes, styles and price ranges. 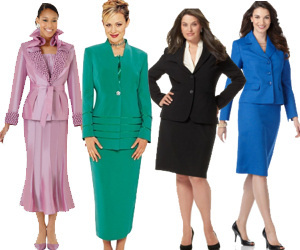 For almost any business occasion, Pantsuits are as acceptable as skirt suits. To get the most bang for your buck, buy suits that you can mix and match with other items in your wardrobe. If you get a traditionally styled suit with a blazer, you can change the look of the suit with different blouses, tops, scarfs and even transform it from a business look to a dressier or more casual look. If you are different sizes on the top and bottom, you may want to opt for suit separates for a better fit. Another plus to buying suit separates is that often you can get a skirt and pants to go with your jacket. When you're a business woman who also happens to have curves, there comes a day when you will likely be shopping for a plus size business suit. There are a couple of directions you can go with this quest. There's the plus size skirt suit or the plus size pant suit. Both have distinct advantages. Overall the plus size skirt suit looks more formal. 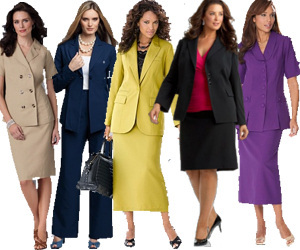 If dressy is your goal, definitely consider a skirt suit in traditional colors like brown and black. This suit's skirt should not be any shorter than the top of your knee cap. You're best with a straight A-line here combined with a jacket that hangs to your hips. This accents the best aspects of your body without looking "cheeky". The most flexible part of a business suit is the jacket. By choosing a few classic jackets you can then mix and match these to either a skirt or pants for variety. This is also where you can get a little more colorful. A tasteful black jacket paired with a dark paisley (for example) looks professional and it works great if you end up in a business dinner! One thing that's very important with a plus size body is making sure your suit fits properly. Even the best designers have to use basic measurements in different combinations in making their Plus lines. This means that you may find it difficult to get that perfect fit. When that happens it's well worth getting a tailor to help you. You're investing in a GOOD suit, one meant to last - so do it right the first time. 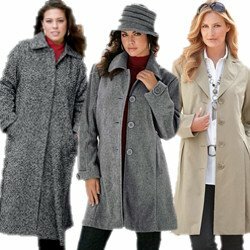 Bear in mind that a plus size business suit is only one part of creating the entire professional demeanor. Everything including your makeup, hair style and accessories matter. With makeup and hair you want something that lasts even if you end up walking in the wind or sitting in a stuffy boardroom. Accessories are pretty personal - but one "power" touch like a red pocket scarf might be ideal. All these little efforts blend together to make a pleasant professional image that people remember.